Our mini pig has sarcoptic mange, and I previously wrote about his symptoms and how we diagnosed it. We are almost finished with his second round of mange treatments, so I wanted to provide an update on how we’ve treated the mange and on how Oscar is progressing. 1) The first round of sarcoptic mange treatment. Oscar was initially diagnosed with sarcoptic mange right after we brought him home for the very first time. I’ve already discussed the symptoms that led to the diagnosis, so check out my previous post if you are interested in that or are looking for help with figuring out if your mini pig has mange. Oscar received three doses of oral Ivomec, and each dose was given 14 days apart. The vet tech gave Oscar his first dose, and it was a struggle. Oscar was only 6 weeks old and wouldn’t take a treat from a person, let alone medicine. We gave him the next two doses at home by squirting the Ivomec on top of his food, and that was much more effective. We were also instructed to wash his bedding and vacuum after each new dose of Ivomec, so we did that as well as disinfecting any places he used as scratching posts, mainly furniture and wall corners. Oscar started to show improvement after the second dose and was scratching less. By the third dose, he was much better and we thought we were done with the mange. 2) The second round of sarcoptic mange treatment. Unfortunately, Oscar was somehow reinfected and the mange came back. This time it was worse; he had sarcoptic mange and a secondary staph infection. I felt awful that we let it go on for so long, but I assumed the first round of meds had taken care of the mange. Give three Ivermectin injections, each 14 days apart. Give the antibiotic every 12 hours for two weeks. Keep Oscar isolated in one room of the house and away from the dogs and us (since the mange can be transferred to dogs and humans). Wash our hands and clothes after contact with Oscar. Wash Oscar’s bedding and blankets (or switch them out) every day. Clean his crate every other day. Treat our dogs for sarcoptic mange using Revolution. We haven’t seen any obvious signs of mange on our dogs such as intense itching or hair loss, but we treated them as a precaution since the mange returned. Use a perimeter spray in the house at least once a week to kill any mites in the house. The spray recommended by our veterinarian was Vet Kem Siphotrol Plus II to kill the mange mites throughout our house such as on furniture, carpets, and other surfaces, but it can be harmful to some animals and in some circumstances, so make sure to consult your veterinarian before using it. Oscar is through his second Ivermectin injection and we are following all of the instructions. In all honesty, it has been a tough few weeks. All of the cleaning and washing is wearing on me, but the hardest part is isolating Oscar. He is still young, and we so badly want to play and cuddle with him. It’s difficult seeing him stuck in a small room when he wants to come out and be with us and the dogs. Oscar’s spirit has been amazing throughout the process, and he seems to be doing better. He isn’t itchy, and his skin is finally starting to improve which is encouraging. He still gets to go outside to run around and eat grass which helps get some of his energy out. Still, I’ll be glad when the mange is behind us and we are back to normal. I have some regrets about how I handled his mini pig mange the first time and have learned so much more about it since then. I will follow up soon with a post about what I’ve learned throughout the process of dealing with the mini pig mange and what I would have done differently. Although I personally recommend the items discussed in this post, some of the links are affiliate links. LifeWithaMiniPig.com is a participant in the Amazon Services LLC Associates Program, an affiliate advertising program designed to provide a means for sites to earn advertising fees by advertising and linking to amazon.com. Hi Cathy! Mange sure isn’t fun, but at least you shouldn’t have to deal with it again once it has been treated successfully (unless there’s contact with other pigs). Hope our posts on mange helped! Have you treated yet? 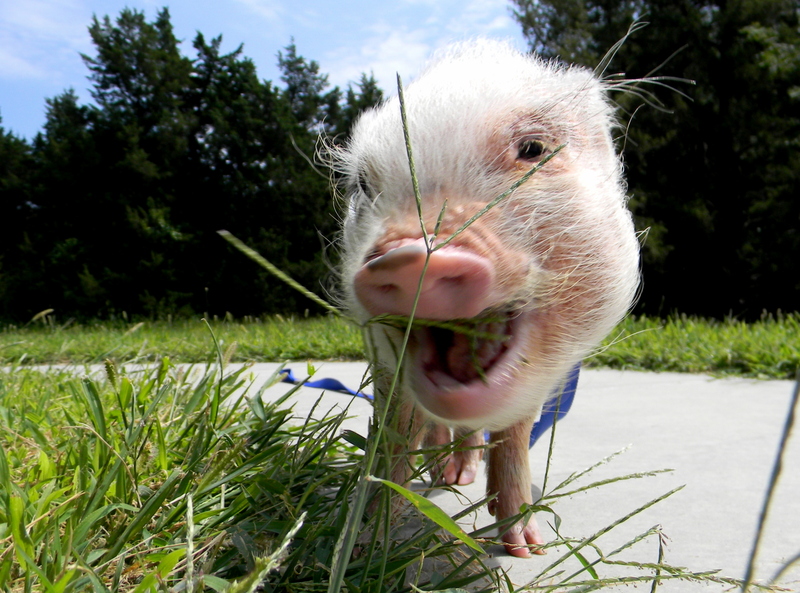 Does your piggy have symptoms of mange? It’s supposed to be .2 ml for every 10lbs. I’ve read it’s more effective when given as an injection. 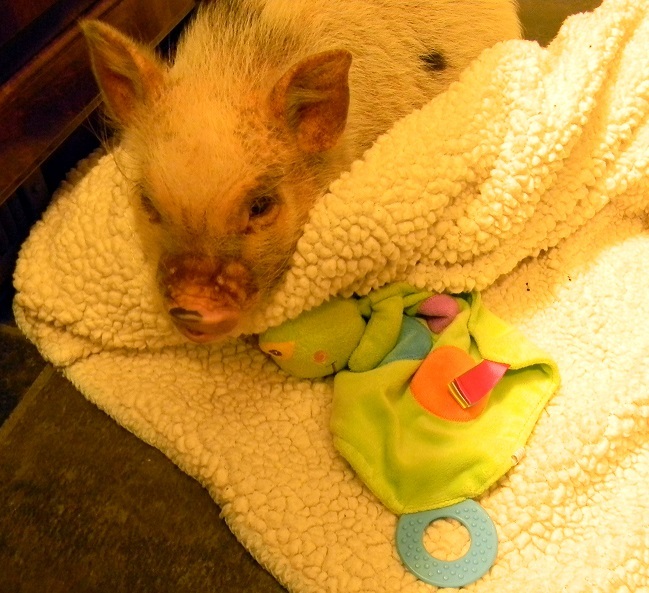 We are also treating our pig as he was diagnosed with the mites in feb.
hey there! 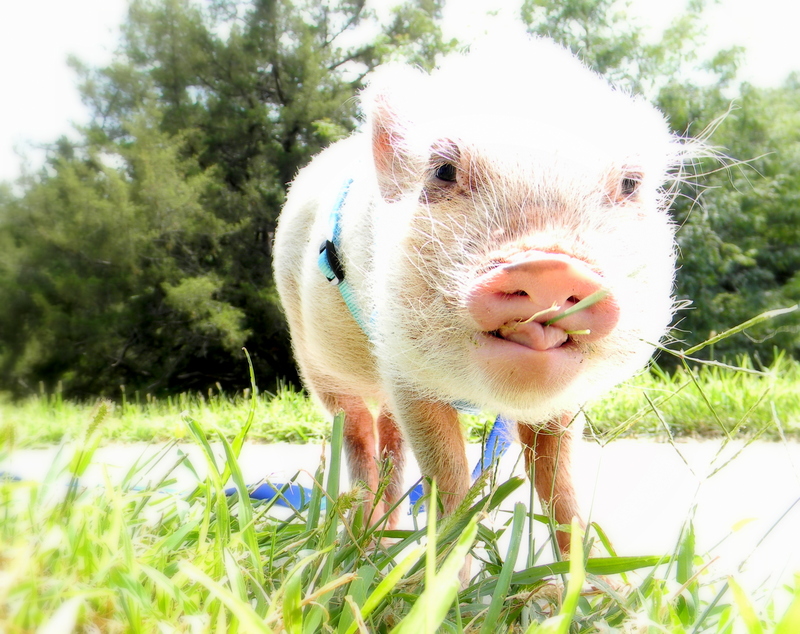 i just got my new piggy and just saw your site, his name is Oscar too! lol anyhow, he has this rust color on the top of his head , itis also on his ears and lighty on his spine. he has it alittle around his eyes and nose. I have heard about pig rust but i do not think that is what this is. He just started iching but he doesnt itch that much at all. It just appeared 2 days ago. Do you think its mange? I was wondering if you treated his ears as well. I heard the mites in the ear wax aren’t killed by the ivomec unless you put drops in the ears. I am going through the same thing as you were. Got a piglet full of mange and it’s so hard. I feel so bad. I have two kids and don’t have a room to confine him in. He has his own area in the living room that is gated. So I use my steam cleaner and vacuum daily. And was the bedding daily.